240 pages | 55 B/W Illus. With future competitive landscape shifting from competition between companies themselves to trading partner networks, understanding and mastering process design and change is becoming more critical than ever. In order to succeed, companies are starting to weave their key business processes into hard-to-imitate strategic capabilities that distinguish them from their competitors. Supply Chain Networks and Business Process Orientation: Advanced Strategies and Best Practices will help you "connect the dots" by offering insights on how to achieve greater integration within your supply chain networks and realize the performance possible with today's interaction economics. Based on exhaustive research of supply chains and newly successful networked corporations in the US and Europe, the authors demonstrate how your company can be successful in building an effective supply chain network. Prescriptive benchmarking models illustrate proven strategies, tactics, and methods for achieving a superior level of supply chain performance. "The authors have developed a focused, rigorous methodology for assessing supply chain processes and identifying the path forward for establishing specific performance improvements. 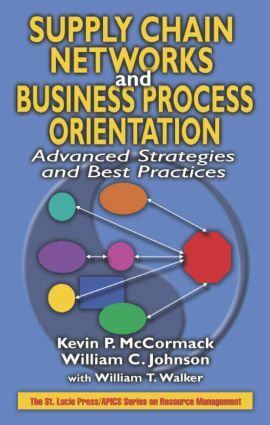 Managers from many different functions can benefit from reading this book and applying the lessons to their own supply chain business processes."